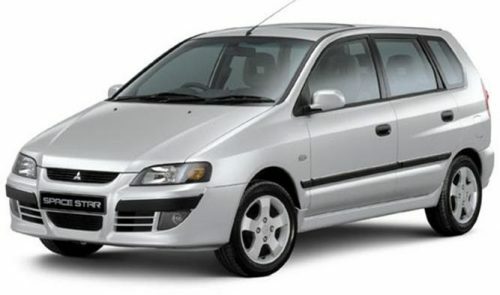 Mitsubishi Space Star PDF Workshop and Repair manuals, Wiring Diagrams, Spare Parts Catalogue, Fault codes free download! Mitsubishi Space Star is a subcompact of Mitsubishi, manufactured from 1998 to 2005 at the NedCar plant in the Netherlands. Space Star is created on one platform with Mitsubishi Carisma and Volvo S40 / V40. The Premiere of Space Star was held in 1998 at the Geneva Motor Show. In 2002, Space Star was updated. The car received a new optics: the assemblies from the headlamp and the turn signal were replaced by a single headlamp, the rear lights were stamped, resembling the lights of the Volga GAZ-21. The shape of the front bumper, radiator grille and fog lights changed. The color of the company badge was changed from red to silver. On the Space Star petrol engines were installed in a volume of 1.3 liters. (80 – 84 l / s), 1.6 liters (98 l / s), 1.8 liters. (112 l / s) and 1.8 liters. GDI (121 hp). The line of diesel engines consisted of 1.9 liter DI-D (101 l / s) available since 2002 and 1.9 liters. DI-D S (115 hp) since 2003. All engines were inline four-cylinder. In 2008, the model Mitsubishi Space Star took 10th place in the reliability rating of cars with a run of the German magazine ADAC.